Video games are a seasonal product. There are some purchases throughout the year, but demand increases a lot during Christmas. The time of year with the lowest prices - November. 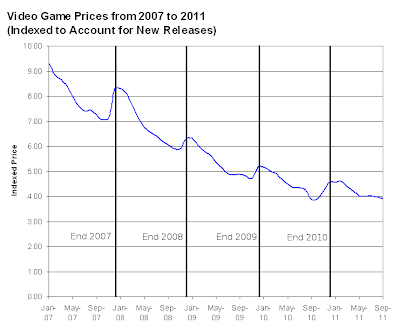 Below is a chart showing the prices from 2007 to 2011. The prices every January are indexed to start at 1 to show the seasonal trends. In three out of four years the lowest price of the year was November. 2010 was the only exception with the lowest prices during September. On average prices decrease 25-30% from January to the low point for the year. Then during December prices jump 10-15%. If you are a game collector don't buy games during December or you will be paying a premium. Below is a chart showing the past five years of data on a continual basis instead of stacked to show seasonality. 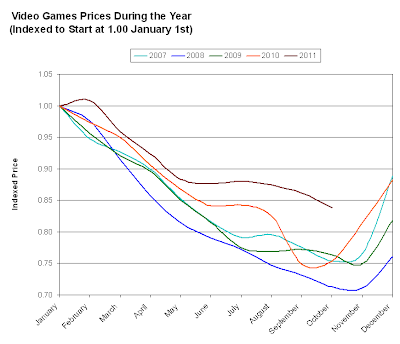 The seasonal spikes during Christmas can easily be seen but in general video game prices are decreasing. Older consoles like NES, Atari, and SNES do not follow this same general trend. Their prices are increasing or holding steady in general as seen in the images below. 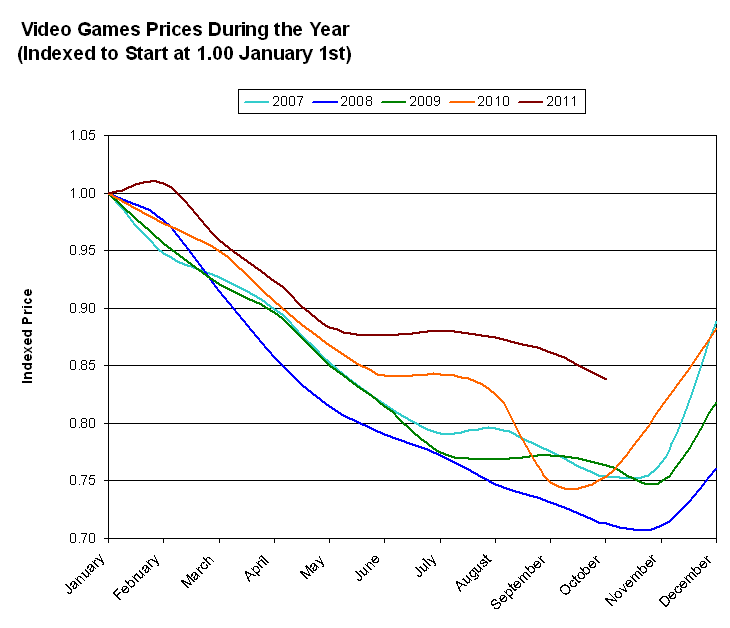 I believe this is the cause for the smaller price decreases during 2011. The newer the games are the more pronounced the decline. This can easily be seen by comparing Playstation 1, 2, and 3. The curve down is much steeper with Playstation 3 than it is with Playstation 1, which means the prices are decreasing faster for PS3 than they are for PS1. Methodology: Every licensed, commercially released, NTSC game is included in the prices shown. New releases are excluded during the calendar year they were released to remove upward bias when new games come out. You can read more about the price indexes for each console here. 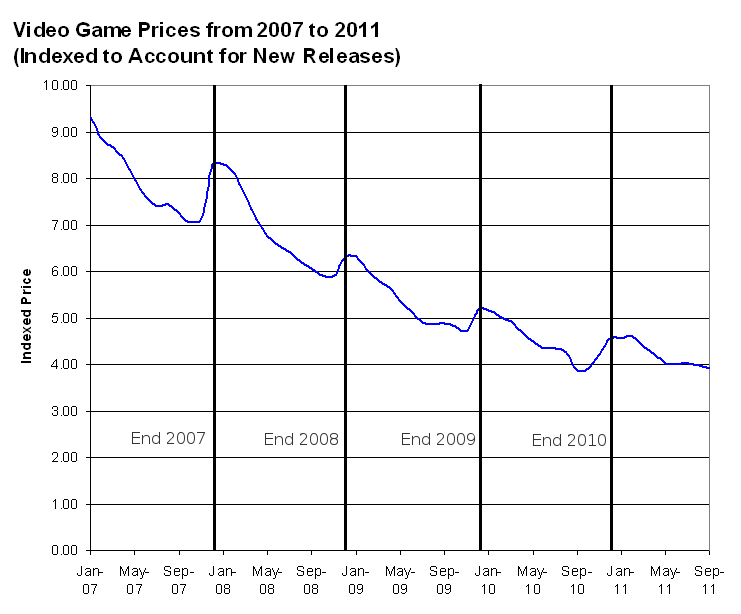 I'd like to request a chart that shows an overlay of the top 15% most expensive games price changes over the normal chart of the system's average. I'd assume those raise faster than the average game. Also, it would be awesome to see that first chart updated frequently.